The utilities menu provides access to this help screen, as well as other functions that are outside of the typical flow of OnSong. The following details the function of each item in this menu. Backing up your library is important to prevent downtime in the case of an emergency. This menu option opens the backup screen that enables you to manually or automatically backup your OnSong library. This menu option provides access to the Getting Started screen. This provides links to the user manual, videos, and other information you need to get started using OnSong. Gives you quick access to communicate with the OnSong team. Some features don't fit in the normal flow of the app. Editors gives you access to other functions for configuring OnSong. OnSong is a powerful app, and add-ons make it even more powerful. Manage your add-ons in this screen. The console allows you to manage your OnSong library through a web browser making adding and editing chord charts easy. For every musician, there's different way to do music. 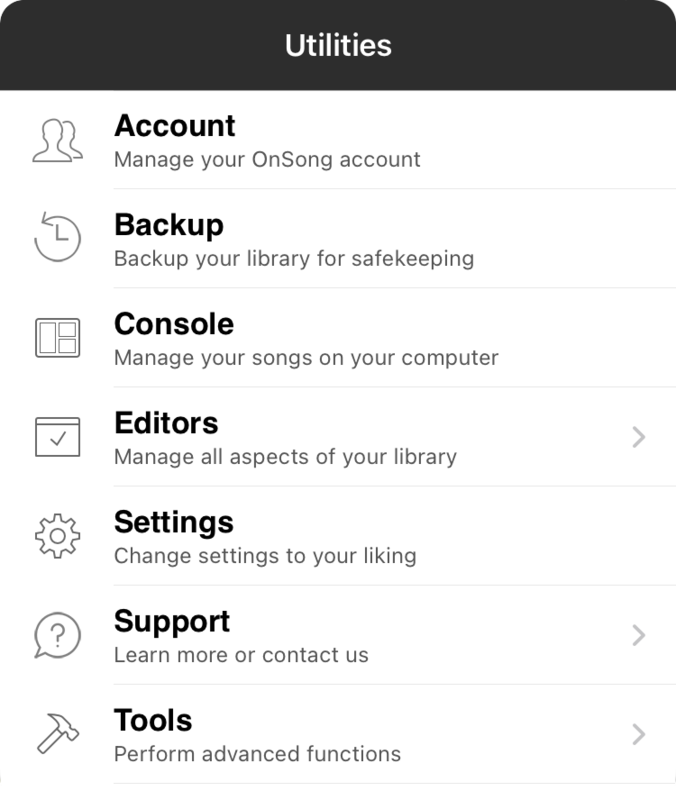 Settings let you configure every aspect of OnSong. Provides more advanced tools for managing your library.